Differentiate between a rainscreen and a barrier façade. Choose a panel installation system appropriate for the application, budget, and local climate. Describe the benefits of using a composite metal panel system. Explain how pressure equalization reduces water penetration. In the complex world of integrated building design, the term façade has taken on a larger role than just the front-facing side of a building. More apt these days is the term “skin.” For façade designers, this includes the whole wall assembly—the entire envelope that separates indoors from outdoors. This article zeroes in on one critical aspect of the façade's performance—moisture control—looking primarily at composite architectural panels. Composite metal panel systems can provide an effective “first defense” against wind-driven rain—the most unruly and damaging class of moisture that buildings must repel—provided the system is appropriately detailed and is installed precisely as detailed. Over the life span of a building, no other force acting on the building proves more insidious, more destructive over time, than wind-driven rain. It comes at a building with erratic force. It is predictable but irregular, and this variability lowers the tolerance for error. Rain does not simply fall straight down. If it did, and all one had to contend with was gravity to keep water out of walls, creating a moisture-resistant exterior would be much simpler. Not fool-proof exactly; there are plenty of errors with flashing and weep systems to be made that can always make gravity-driven water a concern on any building project. But from a design perspective, drip moldings, through-flashings, and weep channels are straightforward, easily managed solutions. 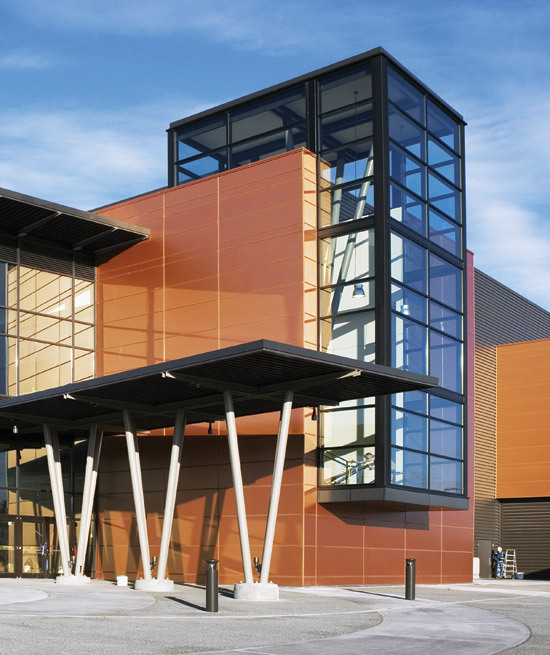 A warm metallic finish and resistance to wind-driven rain are two essential ingredients for the exterior of the Lynnwood Convention Center, located on Puget Sound near Seattle. Photo courtesy of Laminators Inc.